Escrow. What is it? Just because Joey and Chandler don’t know doesn’t mean that escrow is difficult or scary. How does escrow help a buyer and what should we be ready for? 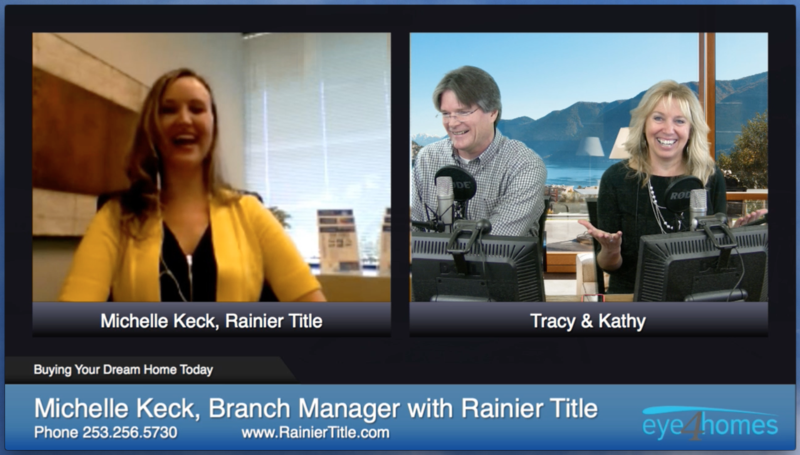 Michelle Keck of Rainier Title explains the escrow process, closing costs, and the benefits to home buyers, with hosts and Realtors Tracy and Kathy Nelson. The complete transcription of the show is below the video. eye4homes :: I just love that scene. You would. You just love Friends don’t you. That was my suggestion to put it up there. Yeah. Welcome to our show today. Hi I’m Kathy. And I’m Tracy, and we are a husband and wife real estate broker team with John L. Scott in Redmond Washington. 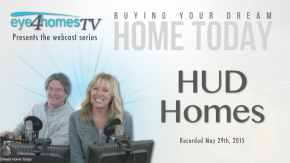 And this is a live webcast that happens every Friday at noon and it’s about buying your dream home today. It’s focused on making sure that you have the confidence you need to go out and and buy that dream home. And today’s topic is escrow. And we have a wonderful guest on to help us learn all about escrow, and her name is Michelle Keck, she’s with Rainier title in Puyallup, Washington, I believe. Right Michelle? Hello Michelle. Michelle :: Hi Good afternoon. eye4homes :: Good afternoon. It’s so nice to have you on the show. You’re in Puyallup, right? Michelle :: Well I actually manage both the Puyallup and the Bellevue Rainier Title office. eye4homes :: Wow! But every time I hear Puyallup it’s “Do the Puallup”. Michelle :: Yes. There is a little fair down there. eye4homes :: Just a little one. Well Michelle tell us a little bit about yourself. Michelle :: OK. First, thank you for having me. I’m excited to be here and as you mentioned I’m Michelle Keck with Rainier Title. I have been in the escrow industry for nearly 17 years. I started as an escrow assistant. I moved into commercial escrow over to the legal side of title and escrow. I’ve been in sales, marketing, education. I’ve been LPO for almost 7 years, and a manager at Rainier Title for 4.
eye4homes :: Well very nice. That’s quite the career I have to say. Yeah it’s really nice to have you on because so many people like the Friends episode, whenever people talk about escrow it’s like, where is escrow? What is escrow? So let’s talk about what is escrow. Michelle :: So escrow really I think the biggest thing to remember about escrow is that we’re a neutral third party. We do not represent anyone in the transaction, however we have a duty to protect everyone’s best interest. And everything that escrow does is provided to us in writing. So typically on a purchase our initial instructions are going to be the purchase and sale agreement. So everything that escrow needs to accomplish is basically written in that purchase and sale agreement. We are essentially a safe place for the buyer and the buyer’s lender to deposit the closing funds, and at the same time a safe place for the seller to deposit the fully executed deed that will transfer the property. So basically we wouldn’t have a buyer who’s willing to pay for the property before the seller has transferred it to them, but at the same time a seller isn’t going to transfer the property before the buyer has paid for it. So this evolved escrow where we are preparing closing documents, the HUD-1 settlement statement which we can talk more about, and the deed that will transfer title. All of that stuff sits in escrow until the terms of the purchase and sale agreement have been met, and then once we’re all set to close we then will record the deed and utilize the funds according to the party’s agreement. eye4homes :: And you mentioned it several times, and that’s how I picture it. It’s like the safe haven of all your really important… I’m mean you are buying a home. It’s a big deal. It is. It’s got the title. It’s got the purchase and sale. The money you’re putting down. All of it… and this is why we wanted to have you on here… escrow plays a huge part of buying a home. And so, it’s all nice and safe, it’s with the escrow. Let’s talk about the purchase and sale agreement for a minute. That’s your guide. eye4homes :: And you go through everything that the agents, the brokers, and the buyer will put on that piece of paper. That’s kind of like your your, I want to say your bible but it’s not really your bible… it’s your script… to go through and go line by line of all the things that you need to do and get the money, you know the purchase orders or whatever it is, the cashier’s check, the cash, and you put it in a nice safe place. All carefully orchestrated. Michelle :: Yes that’s exactly correct. The purchase and sale agreement is our instruction, or the whole kind of the driving document for all whole file. It tells us what terms the buyer agrees to purchase the property and what terms seller agrees to sell the property. So in that purchase and sale agreement there’s so much in there. It will talk about our closing dates, our purchase price. If the lienable utilities are paid through closing what happens to any assessments, all the way down to what deed we as LPOs are instructed to prepare that will convey the property, as well as what sort of title insurance policy the buyer will get from the seller. There are so many other conditions in there. That’s just a handful of the ones that really directly affect escrow, including closing cost credits that need to be negotiated and all those other items. eye4homes :: And so once people, when the buyer and the seller sign this with the broker, then that goes right into the escrow process right? It starts right away after that. Michelle :: Absolutely. Once we are provided the purchase and sale agreement, that’s when escrow is officially opened. So we go through the process of opening the transaction. We order the title. Sometimes it’s just an updated title. But we get the title report, so we’re going to see any liens, or judgements, or restrictions, basically everything that’s been recorded on that property. eye4homes :: Let’s talk about what a lean judgement, anything on that, since you brought that up. That sounds kind of important. Michelle :: So basically what we’re going to look for as escrow is, we assist the seller in clearing title. The purchase and sale states that the seller will provide the buyer with clear title, so we’re going to get essentially payoff statements, or invoices, for each of the monetary items listed on the title report. So if the seller has a mortgage, it’s recorded as the deed of trust, if they have a deed of trust on the property we will obtain a written payoff statement from the lender that they make those payments to. There’s property taxes. We may see a judgement against the seller that will need to contact the judgement creditor and make sure it is taken off so that at closing everything against the seller is released or reconveyed. That’s the process of removing an item from title. And so we go through each of the paragraphs of the purchase and sale and make a determination on is it a monetary item that needs to be cleared, or is it a restriction or covenant that stays with the property even along with the buyer purchase, and that goes along with the property. eye4homes :: That’s a good point. And the judgement, again, I mean, it could be nothing. It could be something that just needed to be cleared, but you help them with that. Michelle :: Absolutely. And something I want to mention with judgments are, we not only search the property, but we search the names of the seller and the incoming buyers. And the reason for that is there are certain judgements and leans that attach to a property automatically because they have attached to the person. And that’s where there’s a document that’s called a statement of identity that is often needed, especially if we are working with a buyer and a seller with a common name. Because, with the name Michelle Smith, that’s a very common name. If that were to be searched in the public record, chances are there would be numerous items against Michelle Smith. So I will complete a statement of identity essentially to determine if those items are against this Michelle Smith, our buyer or seller, or against a completely different Michelle Smith. That’s when title supplements will be issued that either confirm or remove those items. eye4homes :: That is great. It sounds like you’re our best friend. I know, but also, I have Kathy Nelson. There’s probably a billion of those. It’s a nice piece of mind for a buyer or a seller to just know that someone is looking out for you. This sounds like it is a pretty lengthy process. How long does it really take? Michelle :: You know, I would say that a typical escrow we are seeing is about 30 days. We have quick closes that can close in as little as two weeks. And depending on the transaction we have some that can take 45 days, 90 days, or believe it or not, years. Every transaction is so different. Although the escrow process is essentially a very stream lined process, every transaction is different. I would say typically 30 days is probably a normal closing. eye4homes :: Ok, so you have peaked my interest there. Two weeks? So is it like an all cash offer? Michelle :: Typically we’re going to see that in more of an all cash, or what’s called a hard money lender which are ones that don’t go through the same process that a traditional lender would have to go through with documentation, credit report, and all those sort of things. eye4homes :: Do you pull up the credit reports and most of the stuff, like, right at the beginning. Michelle :: So at escrow and title we never see the credit report. 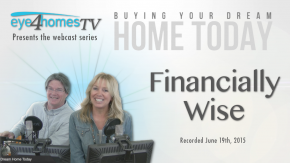 eye4homes :: Oh, see, see, that’s a good… ok.
Michelle :: It is always on the lender end where their going to go through and look at the credit report, and that’s part of the lender approval process. But escrow we typically don’t see appraisals. We typically do not see credit reports. All that’s kind of done outside of our involvement. eye4homes :: That’s really good stuff to know too. Because people don’t want a lot of people looking at their finances. So that’s good to know. Mainly the mortgage lender that you’re working with will know that stuff. You’re the ultimate traffic cop. You don’t need to see inside the car, but you need to see where everything is going. Very good. Michelle :: There you go. Yea. 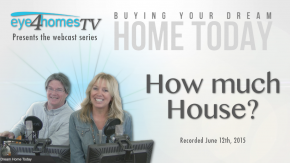 eye4homes :: Well, closing costs, let’s talk about those for a minute. What are we talking about when we’re talking about closing costs when your buying a home? Because that comes up a lot. Michelle :: Absolutely. So we have the typical closing costs in a real estate purchase. We have the commission, which are typically, and I say typically just because every transaction is different, the commissions for the real estate broker are typically paid by the seller. Loan costs are typically a buyer cost. And then we go into what called prepaid items, and those are part of the lender charges. Those can vary greatly. I’ve had people ask me what are typical lender charges, and like I said, everything is so different. Every lender is different. So that’s really a hard question for escrow to be able to answer, but that is part of what will be on a HUD-1 settlement statement. And in addition to the loan charges, there going be title and escrow charges. Escrow, it’s written in the purchase and sale agreement that the escrow fee is split evenly between the buyer and seller. The owners title insurance, again, according to the purchase and sale, is paid by the seller. The seller is purchasing a policy to insure that the buyer is receiving clear title. If the buyer is getting a loan, the buyer will then insure the lender that their protected, so the buyer purchases title insurance for the lender. We then will have recording fees, which is to record the deed that will convey the property from the seller to the buyer. And the deed of trust is typically the other document that gets recorded. There’s situations where we may have additional documents, maybe a power of attorney, or a quit claim deed, but that’s like I said, I go back to the every transaction is different. Then we jump into excise tax. Excise tax is typically 1.78% of the sales price, and its typically a seller cost. And then we’re going to see property taxes that get prorated, so the buyer pays during the period of time that they own the property, and the seller pays for the period of time that they own the property. Any home owners association dues that need to be paid up front by the buyer are included on that HUD-1 settlement statement, or any dues that are due from the seller at the time of closing, as well as the utilities that we mentioned. And there’s a lot of other charges that could be added, but that on a case by case basis based on the property. eye4homes :: The things are split up really carefully. And it was nicely done, the way you just mentioned what the buyer and the seller are responsible for. That made a big difference for I’m sure many people because that’s a big question. What the heck am I paying for and what is the buyer the seller paying for? So that was really good info. Michelle :: Well and I think also, because every state is different, so when we’re working with buyers that are not familiar with purchasing in Washington, Washington seems to be a little different. Where there are other states that have… we’re special. So in other states buyers and sellers actually sit at the same closing table and sign their closing documents together. And that is typically never done in Washington. Here what we do is once we have received the loan documents from the buyers lender and we’re ready to sign, we’ll schedule the buyer to sign. And that’s typically is scheduled for about an hour. And I have an example of the set of documents here, because I think a lot of buyers hear these terrible stories about how long the signing took, and how awful it was to go through the signing, and I think important to know that although this is the stack of documents that they are probably going to sign, that you know, 100 to 125 pages, as escrow we just go through those. We put them in a particular order to make it the most important stuff that is very specific to the terms of their loan. A lot with the forms are lender disclosure documents that have already gone through with their lender, or pretty common forms where a lot of the forms aren’t actually loan specific. And so we like to put the ones that talk about interest rate, what is your agreement to repay the loan, all that sort of stuff up front so we can get that out of the way. I would say even though we schedule a buyer for an hour, a typical signing is about 30 minutes. And buyers are typically pleasantly surprised when the signing is done the table is empty of all those unsigned documents, and we have a huge stack of signed documents. They usually say that that was a lot less painful then I thought it would be. eye4homes :: You want to show that stack again. Michelle :: Yes. There’s a lot here. eye4homes :: Yes there is, but it doesn’t take that long and it’s not that hard. Michelle :: It doesn’t. And almost the first thing that is first gone over is that HUD-1 settlement statement because it really details all the closing costs that we just talked about, and so, that one really outlines what kind of the meat of the transaction is all labeled there on those couple pages. eye4homes :: I’ve got the HUD-1 statement up here that has a bunch of annotations on it that you sent us, that makes it look not so bad. Michelle :: The color coded HUD is really neat because it breaks up each of the sections. So when we were talking about closing costs I essentially just started in my mind on page two of that statement and went down each section, because that’s how I explain it. I just start on page two and explain all the costs, and by the time we get to page one, we’ve already gone through the majority of the costs, and it helps make page one easier to understand. eye4homes :: Nicely. Exactly. And your used to doing this daily because you help thousands of people I’m sure, get into their dream home. So when they finish this and you’ve closed escrow, and they want the key, tell us what time lines happen here, when do they get to move in after they sign that last piece of paper? Michelle :: I would probably, I would say that if I had 10 buyer’s signings, at least 8 of them would ask escrow when they can get the key, and how they get the key. Even though we handle the funds and we handle the documents side of it, we actually have nothing to do with the key. I always refer the buyer to their real estate broker for the delivery of the key. eye4homes :: We get the fun. You know you do a lot of work there. You should come with us. Michelle :: There you go. Now I get stuck with helping them to move. I know how that works. And now as far as possession, we go back to the purchase and sale agreement. That’s another one of those terms that are clearly stated on the purchase and sale agreement as far as is possession upon closing, and within the contract it states – I don’t recall right off the top of my head – I’m getting that time that possession that the buyer can have possession of the property, so I always refer the buyers to their real estate brokers to be able to talk about possession and how they get their key. eye4homes :: Excellent. Yes and pay attention to that document you are signing and what time you get to move in. So do you think that Joey and Chandler would now understand escrow if they watch this show? Oh yea. If they watch this show I am very proud to say that Joey and Chandler would know everything there is to know about escrow. eye4homes :: Michelle, this has been a wonderful experience. You did a great job. Yes. A lot of good information. She will be back. She’s going to talk about more. Please, please come back. Thank you Michelle. Wait a minute. Before you leave, tell everybody, because they could request you, tell us where everybody can find you. Michelle :: My email is michellek@rainiertitle.com. 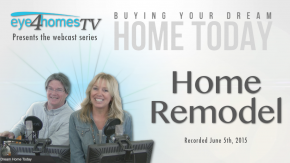 My cell phone is 425-583-4260.
eye4homes :: There you go. We also have a phone there that is 253-256-5730. Michelle :: That is my office line. eye4homes :: Ok. Good. So everybody call Michelle today. All kinds of calls. Alright Michelle. Thank you very much. Thank you again. Michelle :: Oh, you’re welcome. Thank you for letting me be here today. It was fun. eye4homes :: It was. Alright. Bye bye. eye4homes :: So that, hopefully, you understand more about escrow. And that it’s not painful or scary. It actually gets you within 30 minutes, and a signed pack of paper, you get the key to your dream home. It’s just that easy. It’s just that easy. 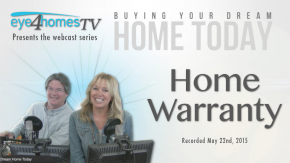 Alright, well you’ve been watching Buying Your Dream Home Today on the Eye4Homes TV network. Yes. Thank you again for joining us. Thank you for joining us and have a great weekend. Yes.